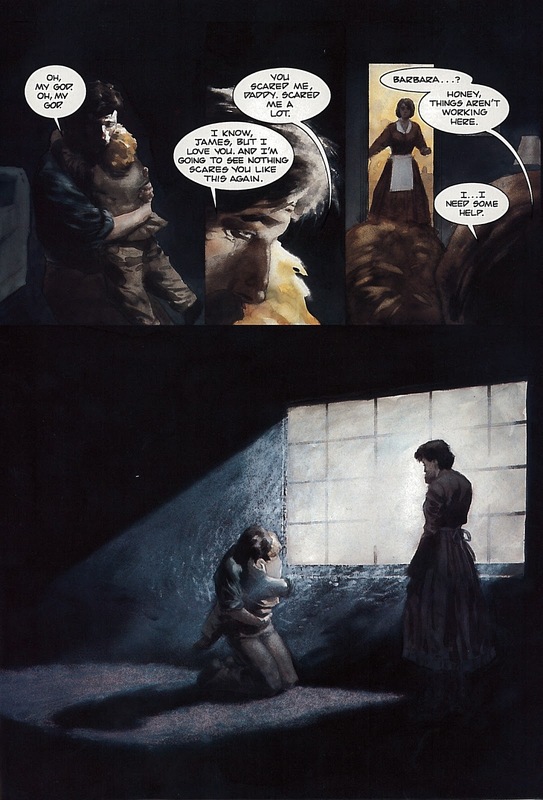 Night Cries shows that the fight Jim Gordon fights is not just against demons external, but internal ones as well. He's under a lot of stress here, trying to navigate the politics required of him by his new position while still wanting to be a beat cop and solve every crime himself, while not neglecting his family-- and also while dealing with his history of abuse. Night Cries reveals that Gordon was abused as a child, and that this has lingering effects. We saw his angry outbursts in Year One, which he channels for good, but here we see the darker side of Gordon, the one which he has to fight to keep in check, and which have a marked effect on his family, even if he's able to stop himself from hitting them. Night Cries is a story about abuse; this moving story about Gordon is weaved together with one about Batman investigating a new serial killer in Gotham, one who seems to have their own issues with abuse. This is affecting in a different way, mostly for the sheer tragedy it evokes. 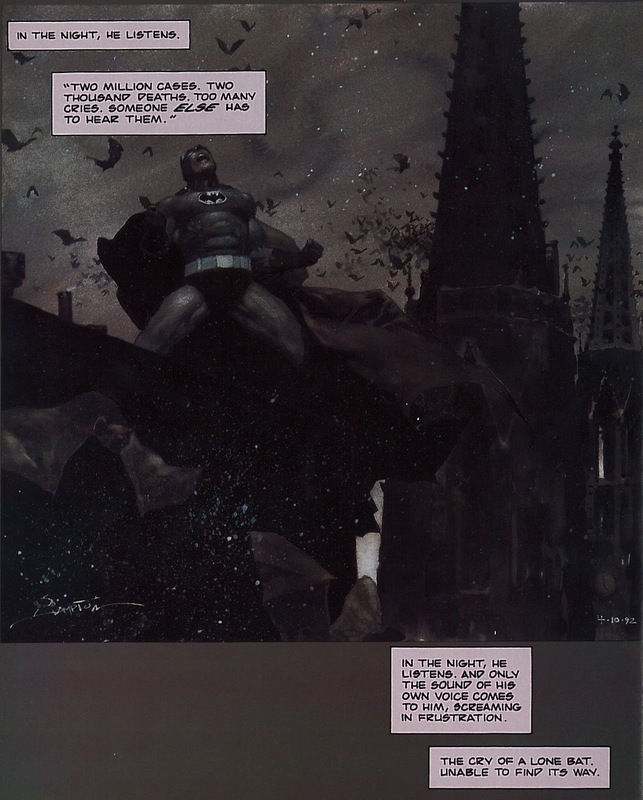 The graphic novel opens with a meditation on the hearing of bats, cited to a 1990 book called A Guide to Wildlife. I didn't get it at first-- it just seemed kind of pretentious-- but upon finishing the book and seeing it repeated, I realized how awful its meaning. 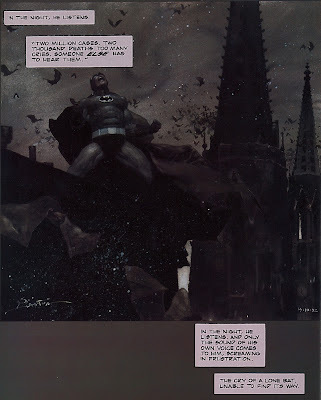 Batman fights crime, his whole reason for being is that having been touched by crime, Bruce Wayne devoted himself to (not unambitiously) the elimination of all crime. But at the end of the novel, as he stands and watches over Gotham, Batman realizes that there are crimes he just can't hear. There are children who need him... and he'll never know about it. It's a sobering moment reflecting on a very real phenomenon, and in lesser hands, I think this book could be terrible. But in Archie Goodwin and Scott Hampton's hands, it's anything but. This book's seriousness and moodiness is such a contrast to what we just saw last week in The Cat and the Bat, yet it still works in its own way. It's a slow read, in a good way: they invite you to linger over the pages, to slowly absorb yourself in this sad, dark world, one which is our world. This superhero story is no fantasy, Batman can't swoop in and save the children here anymore than he can in ours. There are other ways child abuse has to be fought, and while it is, it will continue to have it pernicious effects on families long after the abusers are gone. As Gordon's story here shows, sometimes there are just no easy answers. In Two Weeks: The 1960s arrive in Strange Apparitions! * At this point, we're vaulting through Batman's early days! After seven stories set in Year One, and eight in Year Two, we're down to just one or possibly two per year. I suppose, though, that a lot of gaps are to be expected once all the juicy basics are established.